Photo of Acrobat HD CCTV supplied by Enhanced Vision. Today people with vision impairments can choose from a wide range of assistive technologies to help them read. Many people continue to use braille. A popular way of doing so is with a refreshable braille display, an electronic device that translates a computer screen into tactile form. Similarly, braille notetakers use a combination of keyboards, refreshable braille, and speech. Haptic braille apps even make it possible to use virtual braille keyboards on a touch screen. More material than ever before is accessible by ear. Whereas the first talking book readers had a limited selection from which to choose, nearly the entire Internet can be navigated by blind readers today. 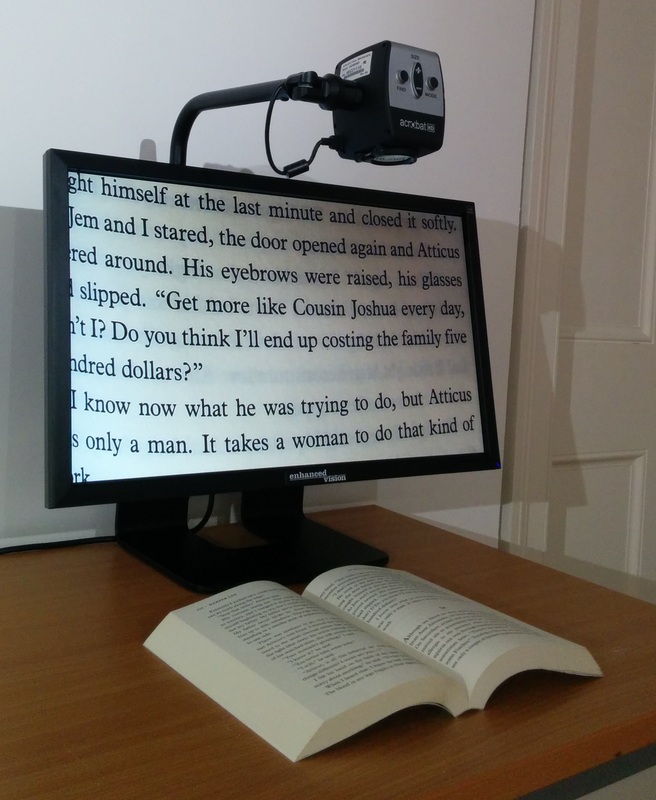 Screen readers use specialized software to convert electronic text into speech. Text-to-speech (TTS) and optical character recognition (OCR) software convert text into audio files or electronic text files. People still listen to talking books, too, on a range of DAISY players. Assistive technologies can also help people to view material. Large monitors and screen magnifiers present an enlarged image of the computer display. People can also use closed circuit television (CCTV), stationary devices that use high-definition cameras to magnify documents, or handheld electronic magnifiers that are useful for viewing smaller items. The most comprehensive device is the standalone reading machine. It reads aloud any document using a scanner, optical character recognition, and speech software that functions without a computer. Reading machines scan print, convert it into text, and then read the text aloud. This panel features three people with impaired vision discussing their personal experiences of reading books in different formats or with different technologies. The speakers include Sejal Sutaria (Research Associate at the University of Exeter), Selina Mills (author of the forthcoming book, Life Unseen: The Story of Blindness), and Peter Bosher (one of the first people in the UK trained to use the Optacon reading device).